The foodservice industry is always evolving. Each year about 10% of the restaurant market is subjected to change, whether it’s restaurant closings, openings, or changes in ownerships. And, according to industry research, data degrades at 2.1% per month. That’s a lot of numbers to keep track of, which is why some operators might be tempted to send more generic marketing messages to their contacts. Keeping track of the turnover and other changes in the restaurant industry is an impossible task when you’re doing it on your own. There is just too much foodservice data and it deteriorates too quickly to be actionable. You’re not alone in facing this challenge, as sales and marketing teams across the world depend on this data to drive their prospecting and sales efforts. Having in-depth, consistent data can put you ahead of the curve by allowing you to craft superior sales and marketing strategies in the foodservice marketplace. Here at CHD Expert we know data. We painstakingly collect, analyze, segment and manage millions of data records in order to provide our clients with the most detailed information possible for today’s fast-paced foodservice industry. We also update our databases monthly to ensure that the foodservice data our clients are using reflects the most recent changes in the marketplace. Are you interested in learning more about how accurate foodservice data can generate higher sales revenue for your company? 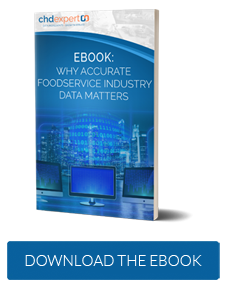 Click below to read our eBook, “Why Accurate Foodservice Industry Data Matters.” You’ll learn not only about the benefits of targeted data, but also how you can use it to develop winning sales and marketing programs.